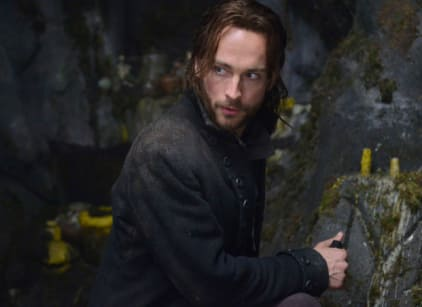 A Revolutionary-era Ichabod Crane is resurrected on the first episode of Sleepy Hollow. Ichabod Crane is sliced open on the battlefield, but only dies after slicing the head off of the man who killed him. Ichabod then crawls from the mud in a grave that seems to be surrounded by voodoo items, sans sliced chest, and walks up out of a pit to the modern world. The headless horseman kills the local sheriff leaving his deputy, Abbie, to take over his investigation and abandon her plans to join the FBI. Ichabod and Abbie form an unlikely alliance. Ichabod sees his wife Katrina while he's in the asylum. Katrina tells Ichabod that when he wounded the horseman, their blood bound them together and when he was awakened Ichabod was awakened with him. He has to find the Horseman's skull, and the answers are in Washington's bible. Abbie and Ichabod find the skull and keep it safe from the Horseman. Abbie's coworker, Andy, is working with the Horseman. Captain Irving realizes that Ichabod is an asset, and sets he and Abbie to work the case together. Ichabod was the first witness mentioned in Revelations, and Abbie was the second. They were brought together to fight for seven years, and their fight will help determine the fate of mankind on Judgment Day.